Last week, the Trump administration released its plan for changing Obama-era rules on fuel efficiency for cars and light trucks. This plan could also curtail states’ rights to create guidelines stricter than the national standards. While the Trump administration believes the change will create more jobs and save lives, opponents argue it could be devastating for the environment. 1. President Obama’s 2011 fuel regulations called for new passenger cars and light trucks to achieve 54.5 miles per gallon (mpg) by 2025. Some states, such as California, have adopted standards even more stringent than this. President Trump is looking to reduce this figure to roughly 37 mpg after 2021. The Department of Transportation (DOT) and Environmental Protection Agency (EPA) issued the administration’s proposal jointly; this policy change would affect cars with model years between 2021 and 2026. 2. 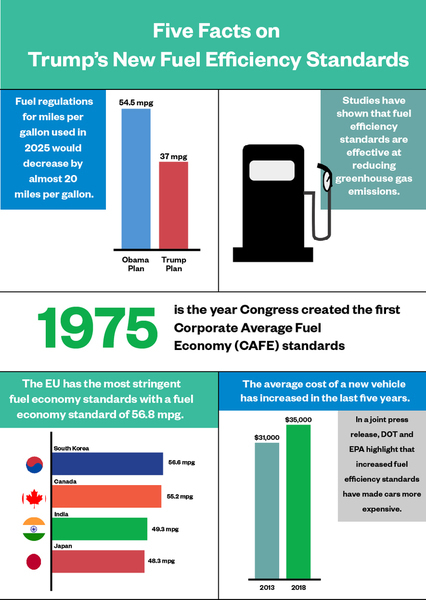 In 1975, Congress created the first Corporate Average Fuel Economy (CAFE) standards; this legislation was largely in response to OPEC’s oil embargo, and called to increase fuel efficiency to 27.5 mpg. Since the 1970s, fuel efficiency for both cars and trucks has steadily increased over time. According to the Pew Research Center, the efficiency for the average passenger vehicle went from 13.5 mpg to 27.5 mpg, and from 11.6 mpg to 19.5 mpg for trucks. In 2007, legislation passed that increased fuel-efficiency standards for vehicles to 35 mpg by 2020. 3. Across the world, fuel economy standards vary widely; today, the European Union has the most stringent standard at 56.8 mpg. The New York Times reports that South Korea’s standard is 56.6 mpg; Canada’s is 55.2; India’s is 49.3; and Japan’s is 48.3. Some experts have indicated that action taken by the United States to reduce its standards could result in other countries loosening their regulations as well. 4. Studies have shown that fuel efficiency standards are effective at reducing greenhouse gas emissions. The transportation sector produces more greenhouse gases than any other industry. In 2011, the EPA calculated that President Obama’s 2011 fuel regulations would keep more than 6 billion metric tons of greenhouse gases out of the atmosphere. According to Inside Climate News, this is more than the country’s total carbon emissions in a year. 5. In its joint press release, DOT and EPA highlight that increased fuel efficiency standards have made cars more expensive; today, the average price of a new vehicle costs close to $35,000, up from $31,000 five years ago. The Trump administration believes that reducing fuel-efficiency standards will make cars cheaper. This will encourage more consumers to buy new cars and trade in their older, less reliable models. No Labels is an organization of Democrats, Republicans, and independents working to bring American leaders together to solve problems.